Steven will be taking part in a crime evening at Nottingham Waterstones on Friday November 6, 2015 at 7pm. He will be in discussion with fellow crime writers, Stephen Booth and Glenis Wilson about the nature of crime writing and the creation of a fictional detective. The event will take place at the Sillitoe Room at the Nottingham Waterstones store fom 7pm. For further details check Nottingham Waterstones Events page here. Acclaimed thriller writer Steven Dunne is speaking at the Everybody’s Reading Festival in Leicester on October 1st, 2015. He will be appearing as part of a crime ﬁction panel discussion involving Alan Seaman, John Martin, crime writer M P Wright and Jane Hill, BBC journalist, novelist and stand-up comedian. The event will take place at Leicester Central Library on Bishop Street, beginning at 6.30pm and ending at 8pm. For further details see Festival web page here. Steve will be appearing at two Waterstones stores in September. He will be at the Nottingham shop on Saturday, September 12, and the Loughborough store on Saturday, September 26th – both appearances will start at 11am until late. 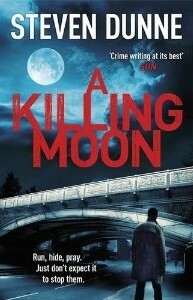 He will be signing copies of his new critically-acclaimed paperback, A Killing Moon, and chatting to fans of the series. “Having spent a year cloistered in an office creating my latest crime thriller, it is wonderful to get out and meet fans of the DI Brook series,” said Steve.